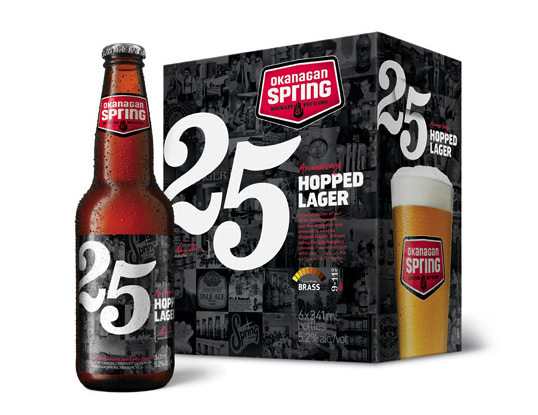 “BC’s most widely-distributed craft beer brand, Okanagan Spring Brewery, celebrates 25 years of craft-brewing excellence at the end of this year, and is kicking off the celebrations with the new release of its latest creation, “25th Anniversary Hopped Lager”. Partnering again with Vancouver’s Subplot Design Inc.
“Our anniversary is definitely a time for us to celebrate 25 years of doing what we love to do: and that’s creating great beers”, says Brand Manager Glen Jessup. “But we didn’t want to just throw a few parties and hide behind a bunch of “hype”. So we’ve done what we do best and have come out with a truly fantastic and unique new product”. 25th Anniversary Hopped Lager has been created by Brewmaster Stefan Tobler as an homage to the original product released in December 31, 1985: by his father, original founder Jakob Tobler. The “25th Anniversary” release is unique by using a “late-hopping” technique that introduces dry hops late in the brewing process. This process adds a fragrant and floral bouquet which complements the unique hoppy taste and clean and well-balanced finish. “Subplot Design have become our go-to-guys for bringing strong brand thinking and design excellence to our packaging”, adds Jessup. “They have helped express our history in a fun and engaging way on the packaging that gives both our consumers, and all our staff, something to enjoy”. The new packaging features a collage of over 70 different photos from Okanagan Spring’s history, including employees, original packaging and trademarks, events and moments which formed who they are today. Subplot completed a complete brand overhaul for Okanagan Spring in 2008 including a new logomark, identity platform, complete packaging system, on-premise materials, taphandles, merchandise and point-of-sale. After suffering 8 years of sales erosion, Okanagan Spring has enjoyed a 10% per annum rise in sales, due in large amount to revitalized interest in the brand at retail through the redesigned packaging. Subplot has also completed select print materials to support the 25th Anniversary, including informational brochures to be seeded in other products, and a 25th Anniversary timeline brochure. Additional materials including a glassware series, in-store displays and posters accompany these materials and use the Subplot-created 25th Anniversary graphics.